Trotskyists Say: Independence for Quebec! The following article originally appeared in the Young Spartacus pages of Spartacist Canada No. 162 (Fall 2009), newspaper of the Trotskyist League/Ligue Trotskyste, Canadian section of the International Communist League. Last December’s Quebec elections gave a first parliamentary seat to Québec Solidaire (QS), a petty-bourgeois nationalist formation posturing as a “left” alternative to the bourgeois-nationalist Parti Québécois [PQ]. QS leader Amir Khadir’s victory in Montreal’s Mercier riding [electoral district] was feted by most of the reformist left, which in Quebec is largely buried within QS. Not even laying claim to working-class credentials (much less socialist ones), QS employs rhetoric about “social justice” to attract PQ supporters dissatisfied with the big-business policies of that party, keeping them firmly in the grip of bourgeois nationalism. We Trotskyists call for Quebec independence in order to remove the roadblock of national antagonisms that divides the workers of English Canada and Quebec, poisoning prospects for united class struggle against capitalism. We agree with Bolshevik leader V.I. Lenin that “a proletariat that tolerates the slightest coercion of other nations by its ‘own’ nation cannot be a socialist proletariat” (Socialism and War, July-August 1915). First and foremost, we fight against the Maple Leaf chauvinism that dominates in the English Canadian working class. At the same time, calling for independence helps combat nationalism in Quebec by giving Marxists a hearing to win Québécois workers away from their nationalist misleaders. In English Canada, the same reformist groups back the social-democratic NDP [New Democratic Party], a party that due to its fealty to the Canadian capitalist rulers has always been hostile to Quebec’s national rights. The NDP joined the forces of “Canadian unity” in the 1980 and 1995 Quebec sovereignty referendums and endorsed Ottawa’s anti-democratic Clarity Act, which legally entrenches the denial of Quebec’s right to self-determination. Back in 1972, then-NDP leader David Lewis applauded the jailing of union leaders during the semi-insurrectionary Quebec general strike, which saw workers take over and run whole towns. Many left groups in English Canada at least try to mask their reformism by opposing the NDP’s “national unity” chauvinism over Quebec. But the “Fightback” group, affiliated with Alan Woods’ International Marxist Tendency (IMT), is an exception. While claiming to defend Quebec’s right to self-determination, they oppose Quebec independence as “divisive.” Spouting rhetoric about the need to “unite and fight,” they intone condescendingly that “an independent capitalist republic” of Quebec “would only isolate the workers of Quebec further from the workers on the rest of the continent, and leave them more vulnerable” (marxist.ca, 1 November 2005). Such specious arguments in defence of “Canadian unity” could easily emanate from the English Canadian union tops (the Canadian Labour Congress also has a paper line for Quebec’s right to self-determination). Whatever the conjunctural sentiments, the Québécois have long asserted their national distinctness; they have compacted a distinct political economy with a francophone bourgeoisie that oppresses its “own” working class, one that also integrates new immigrants. The 1995 Quebec sovereignty referendum only lost (by less than one percent) due to military and economic intimidation and outright fraud by the “federalist camp” run by the government in Ottawa. “United Canada” has long been a poisonous, artificial construct that exacerbates the divisions between English- and French-speaking workers, divisions that are further fuelled by the labour misleaders in both nations who rally the workers behind their “own” capitalists. Quebec independence would not, of course, put an end to capitalist exploitation. But it would remove a major obstacle to making the working class conscious of the need for struggle against their own exploiters. Fightback’s purpose has nothing to do with furthering the class struggle, and everything to do with channelling workers’ struggles onto reformist shoals. In English Canada, their main activity is to call for the pro-capitalist NDP to take office “on a socialist program.” In Britain, the IMT’s parent group has long been buried in the ruling New Labour Party. In all cases, they look to the capitalist state as the instrument to bring about socialism. This flies in the face of the Marxist understanding of the bourgeois state as an organized instrument for the suppression of the working class. As Lenin explained, the workers cannot lay hold of the existing state apparatus and wield it for their own purposes, but must smash it and replace it with their own working-class state, the dictatorship of the proletariat. This perspective was vindicated when the Bolsheviks led the Russian workers to power through socialist revolution in October 1917, and it is what we fight for today. Fightback was among the many groups who greeted Amir Khadir’s parliamentary victory with wild enthusiasm. At a QS congress in June, the spokesman for their Quebec affiliate around the newspaper La Riposte gushed that “the IMT considers the election of the first QS MNA [Member of the National Assembly of Quebec] as the biggest political event in Quebec since the Common Front general strike of 1972”! After this shameless (and historically demented) piece of flattery, La Riposte received formal status as a “collective” within QS. In joining QS, Fightback (like Gauche Socialiste et al.) crossed the class line into an organization that stands outside the workers movement. This is hardly news nowadays when most of the left internationally, having hailed the counterrevolutionary destruction of the Soviet Union in the early 1990s, has accommodated itself to the “death of communism” rhetoric of the imperialist ruling classes. The IMT is long practiced in overt class collaborationism: their affiliate in Pakistan is buried inside an outright bourgeois party, the Pakistan Peoples Party, while in Venezuela they enthuse over the bourgeois populist Hugo Chávez, a former military commander whose capitalist government they paint in “revolutionary” colours. In an April 2007 web posting, Fightback wrote: “Solidaire cannot just be a party of the petit-bourgeois academic Montréal left with less than 6,000 members—it must become a mass party of the Québec working class, based on the unions, that fights on the streets, on the picket lines, and in elections.” In other words, they want QS to become an NDP à la québécoise. This is made explicit in another Fightback statement, which calls on QS and the NDP to “unite together on a program demanding full employment, free education, better health care and an end to the war in Afghanistan” (marxist.ca, 10 October 2008). In the past, all manner of small social-democratic groupings in Quebec have tried to cohere a mass reformist party based on the Québécois working class—and all have failed. With the national question weighing so heavily on all aspects of political life, the Quebec bourgeoisie has not felt the need for a social-democratic formation to mislead the workers. Supported by the union tops, the bourgeois souverainiste PQ, and later the Bloc Québécois, have done that job very well for decades (with the petty-bourgeois QS now available to lend a hand as well). Fightback’s particular twist is to call for “unity” with the chauvinist NDP, a party whose hostility to Quebec’s national rights has made it a virtual non-factor among Québécois workers. More fundamentally, what distinguishes us Trotskyists from frauds like Fightback is that we fight to build a revolutionary workers party, not a reformist one. If a social-democratic formation rooted in the working class did emerge in Quebec, Marxists would have to work out policies and tactics to win workers from its pro-capitalist, social-democratic politics and leadership, much as we do with the NDP in English Canada today. But our purpose is to build a Leninist vanguard party that fights for the overthrow of the capitalist state and the establishment of a workers state; Fightback’s is the bankrupt perspective of reforming the existing state through the election of a “socialist” government in the bourgeois parliament. That is the crux of our differences, and it informs our diametrically different approaches to the Quebec national question. In cozying up to the nationalist QS, Fightback/La Riposte wax on shamelessly about how they supposedly “fight against national oppression” and “defend all the democratic rights of the Québécois—including the right to self-determination, if the Québécois democratically decide on this question” (“Quebec: Whose sovereignty is it anyway?”, marxist.com, 10 June). They add that “the movement for national liberation must be led by the working class” and fault “the bourgeois and petty bourgeois of Quebec” for being “incapable of completing the tasks of the democratic revolution.” This pseudo-Marxist verbiage is written for the unwary. For one thing, far from being a semicolonial country of belated capitalist development (presumably in need of a “democratic revolution”), Quebec is part of the imperialist Canadian state, albeit nationally oppressed within it. More fundamentally, what Fightback is trying to do here is disguise its opposition to Quebec independence. In English Canada, flag-waving jingoism is the habitual reflex of the NDP and labour tops, who deflect workers’ justified anger at the capitalists’ attacks on jobs and working conditions into chauvinist and protectionist campaigns against “foreigners.” The forced retention of Quebec within Canada is part of the bedrock of such Canadian “national” consciousness. Fightback itself pushes Canadian nationalism of the purest water. During the recent B.C. [British Columbia] provincial election, their leading Vancouver spokesman, Mike Palecek, chided the governing B.C. Liberals and the NDP tops for not being protectionist enough, while simultaneously embracing the rulers’ anti-Communist campaign against China. Palecek complained that premier Gordon Campbell allows “lumber companies to shut down mills and send raw logs to China where they are milled in sweatshops, while thousands of workers are laid off here” and that the NDP platform “instead of banning raw log exports,” “calls for restricting them” (marxist.ca, 8 May). This protectionist garbage is the logic of their embrace of pro-capitalist Canadian social democracy. This Marxist approach to the national question has direct applicability for proletarian revolutionists in Canada, where national animosities have long served to cripple working-class consciousness and struggle. Capitulating to Anglo chauvinism, hailing the petty-bourgeois QS, falsifying Lenin—the Fightback opportunists are certainly versatile. But there is one thing that they cannot do, and that is to provide revolutionary leadership to the working class. The Trotskyist League/Ligue Trotskyste and the Spartacus Youth Clubs seek to expose such charlatans as part of our fight to forge a genuine Leninist vanguard party that will lead the struggle for North American socialist revolution. 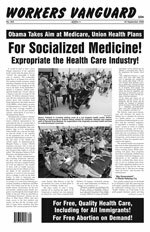 Expropriate the Health Care Industry! For Free, Quality Health Care, Including for All Immigrants! For Free Abortion on Demand! All U.S. Troops Out Now!